Multimedia applications extensively use 3D models. A 2D line drawing is the simplest and most straightforward way of illustrating a 3D object. It is very helpful if such a drawing can be used for generating a 3D model directly. Unfortunately, current CAD tools cannot do it, denying designers a convenient means of input. Therefore, it is highly desirable to develop algorithms that can convert a design sketch into a 3D model. Given a line drawing representing a 3D object, our approach to the conversion problem is finding face topology first and then doing 3D geometry reconstruction. Now we have developed a tool that can reconstruct complex 3D objects with planar faces and common 3D objects with curved faces from single 2D line drawings. We propose a novel approach to 3D reconstruction of complex general objects, including manifolds, non-manifold solids, and non-solids. Through developing some 3D object properties, we use the degree of freedom of objects to decompose a complex line drawing into multiple simpler line drawings that represent meaningful building blocks of a complex object. After 3D objects are reconstructed from the decomposed line drawings, they are merged to form a complex object from their touching faces, edges, and vertices. 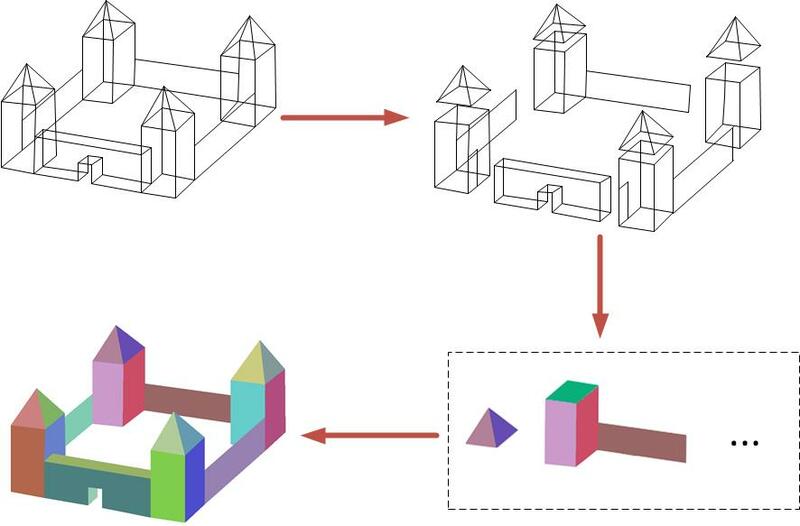 We propose a novel approach, called example-based 3D object reconstruction from line drawings, which is based on the observation that a natural or man-made complex 3D object normally consists of a set of basic 3D objects. Given a line drawing, a graphical model is built where each node denotes a basic object whose candidates are from a 3D model (example) database. The 3D reconstruction is solved using a maximum-a-posteriori (MAP) estimation such that the reconstructed result best fits the line drawing. Given a complex line drawing representing a solid object, our algorithm finds the places, called cuts, to separate the line drawing into much simpler ones. The complex 3D object is obtained by first reconstructing the 3D objects from these simpler line drawings and then combining them together. Several propositions and criteria are presented for cut finding. A theorem is given to guarantee the existence and uniqueness of the separation of a line drawing along a cut. Previous work on 3D reconstruction from single 2D line drawings focuses on objects with planar faces. In this paper, we propose a novel approach to the reconstruction of solid objects that have not only planar but also curved faces. Our approach consists of four steps: (1) identifying the curved faces and planar faces in a line drawing, (2) transforming the line drawing into one with straight edges only, (3) reconstructing the 3D wireframe of the curved object from the transformed line drawing and the original line drawing, and (4) generating the curved faces with Bezier patches and triangular meshes. L. Cao, J. Liu, and X. Tang, In IEEE Transaction on Pattern Analysis and Machine Intelligence (PAMI), Vol. 30, pp 507-517, 2008. This paper proposes a novel approach to reconstructing a complete 3D object, including the shape of the back of the object, from a line drawing without hidden lines. First, we develop theoretical constraints and an algorithm for the inference of the topology of the invisible edges and vertices of an object. Then, we present a reconstruction method based on perceptual symmetry and planarity of the object. In this paper, a novel approach based on a divide-and-conquer strategy is proposed to handle 3D reconstruction of complex manifold objects from single 2D line drawings. The approach consists of three steps: 1) dividing a complex line drawing into multiple simpler line drawings based on the result of face identification; 2) reconstructing the 3D shapes from these simpler line drawings; and 3) merging the 3D shapes into one complete object represented by the original line drawing.